We have new vending machines at work. The old ones required you to pay first before you get the product, while the new setup lets you grab your food item before you even pay. Some employees have already taken to calling it an “honesty store.” You could, after all, just grab your snack and leave without paying for it first. But a warning has been posted in the premises: CCTV cameras are activated. But I think it's too public, who would even dare steal from it? Apart from the novelty of a cashier-less store, what I like about the new vendos are the healthier snack options. There are sandwiches (none today because those apparently sold out already), fresh apples, pears and bananas, and creamy yoghurt. Pricing is comparable to convenience store prices. There are two ways to pay. One can register for a card that comes with free PhP 35.00, and you can top it up anytime. I think that's a good way to budget your snack money. If you runout, then you can't get anymore junk food, juice or soft drinks until your next scheduled top up. No need to go far to top up either, you can do it on the same machine. 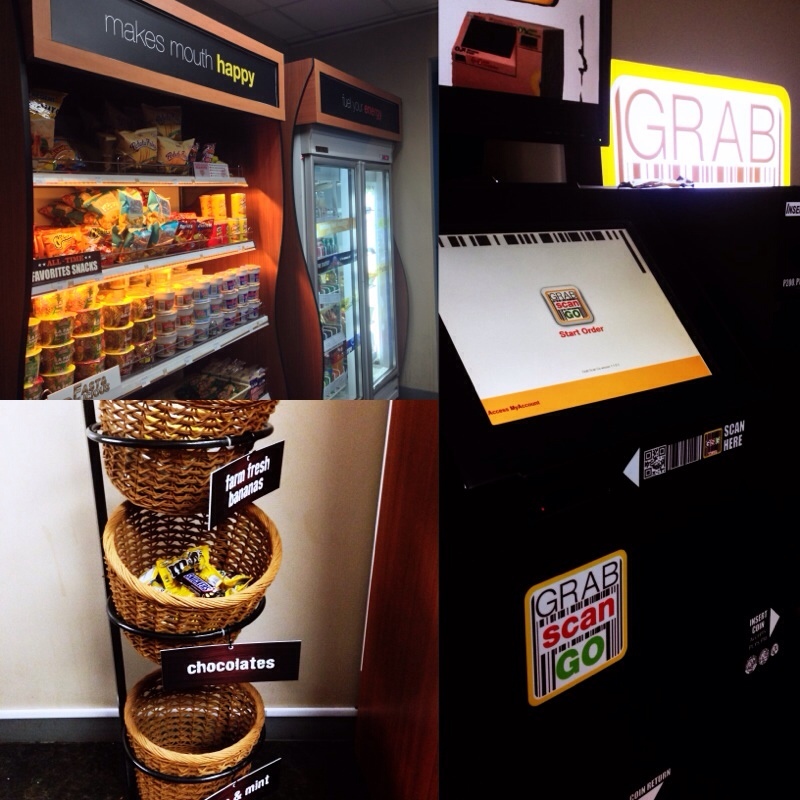 I think free snack card top ups could be a new incentive idea for our agents. But one can also use paper money and coins with the machine. It works like the classic vendo where you just feed it bills or drop in coins and you're given the appropriate change too. I was going to try out the machine today, but when I went back to it, the scanner/cashbox wasn't working. I guess there are still bugs. Hope they fix it before tonight's shift (and restock too). Have you seen or used a Grab-Scan-Go system? What are your thoughts about it? great idea to test the honesty of every pinoy plus the healthier snack choices are a plus to the busy people! This reminds me of the cashier-less store sa Baguio ba yun? I forgot what province, basta na-feature yun on TV. No cashier, honesty lang. Eto naman yung high-tech version! nice concept. i wish everybody’s honest so this can be used in many places. Van´s last [post] ..Simple Joys Photo: Happy Birthday, Ninong! This is nice. Convenient na and you will be disciplined to be honest pa. Hehe… I want to see one in the future. looks good, healthy snacks and honesty is practiced..
Wow. That’s nice. I laughed after seeing the phase MAKES MOUTH HAPPY.. :)Chocolates!!! wow. this is something new. i’ve never seen such device yet here in our city, much more in our office. hehe! galing naman ng nakaisip nito. Rose´s last [post] ..Life is a constant change. This is another way to test people’s honesty. Havent seen this at all! Is this here in the Philippines? ATest oh honesty! where the moon shines » Blog Archive » Grab. Scan. Go. just as good. “As far as Fannie Mae and Freddie Mac are concerned, there is a tradeoff there between supporting the higher priced homes and weaning the housing finance system off of unusual limits it was put under during the crisis,” Bernanke said. disk jockey services in St. Joseph Mo. disk jockey services in St. Joseph Mo.´s last [post] ..disk jockey services in St. Joseph Mo. kind of arrangement they’ll be approved of. I want to tell you that I’m visitying this site foor some time and you share very goold content.